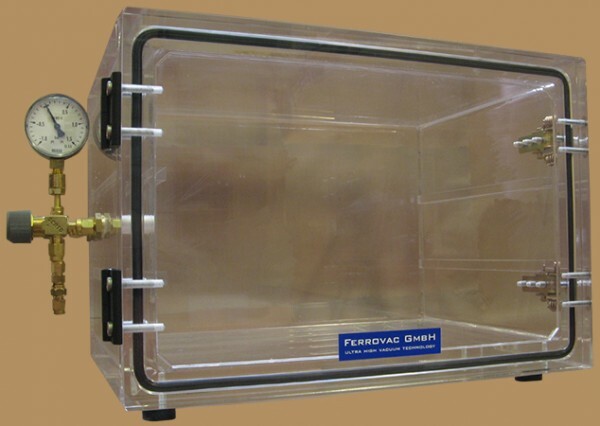 Compact and rigid vacuum exsiccator box made from polished transparent PMMA GS, to store samples under vacuum or in a controlled atmosphere. Pump and vent connection via valve with 6mm Serto tube fittings. The exsiccator is equipped with removeable shelves, offering a clear view and the possibility of placing boxes neatly ordered. After pumpdown using a membrane pump for instance, the exsiccator holds a base pressure of approximately 25mbar for a period of several months. A pressure gauge indicates the vacuum level. The box can be filled with dry nitrogen or argon if desired. An overpressure valve which opens at 200mbar overpressure is provided for safety reasons.